2015 Advent Feature | The Best Advent Calendars Of 2015! For as long as I can remember, we've celebrated the countdown to Christmas in my family with advent calendars, of course this doesn't apply to just my family, but families across the globe! Although we're not just as advanced yet as our friends over in America, we're not far behind! Things have changed since I was a child, I recall calendars counting down past Christmas, and up until new years! These days though, calendars rarely go past the 24th day of December, with Christmas Eve being the last window on the calendar to open! I've put together my selection of my most favourite advent calendars to show off to you lovely lot! I must warn you, they're pretty amazing, and may result in you spending some money! What child, or even adult doesn't like LEGO®? 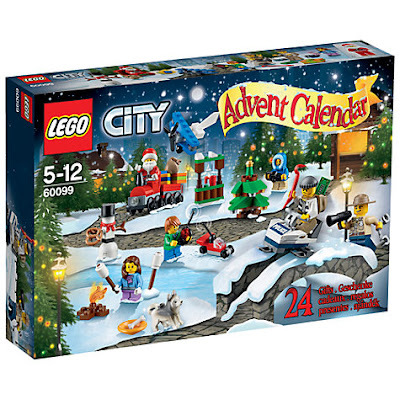 With the LEGO® City Advent Calendar, parents can have peace of mind, not fearing about stepping on tiny pieces, of course until them windows are open! 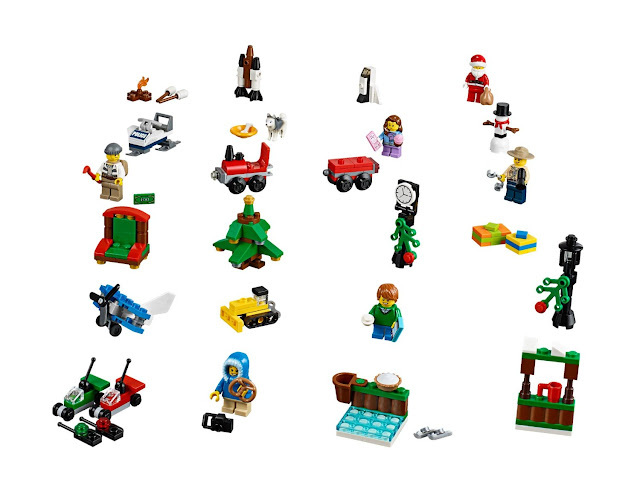 Featuring an awesome 24 gifts that will make each day a special day, this calendar includes six minifigures with assorted accessories (includes Santa! ), two mini cars with remote control elements, a Christmas tree, presents, a dog, a snowman and much more! There is also a LEGO® Star Wars calendar and LEGO® Friends calendar available! Available to buy from LEGO®, Argos, Amazon, John Lewis, The Entertainer, Asda, Tesco, Debenhams and many more places! The Playmobil Santa's workshop advent calendar also has 24 boxes to count down to the big day, and as each box opens it creates a beautiful Christmas scene! With Father Christmas and his two elves helping load the sleigh with toys, pulled by his trusty reindeer! 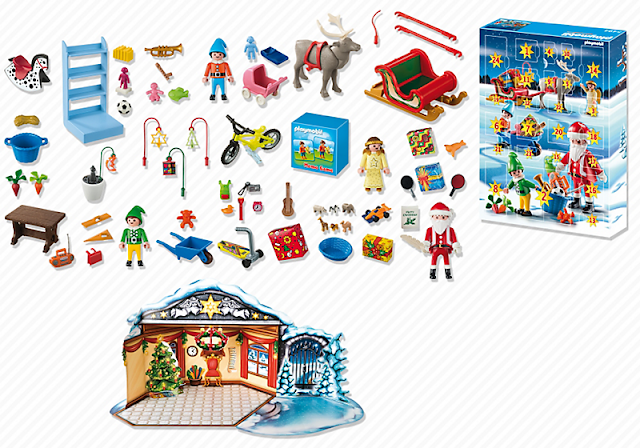 The set contains one angel figure, presents, assorted toys, a wheelbarrow and lots more! The calendar also contains a bonus PLAYMOBIL memory card game! 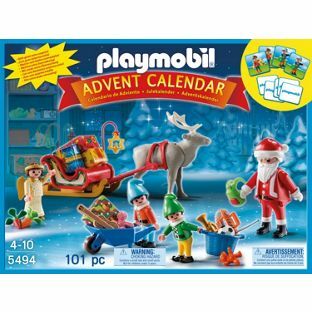 There are a number of other PLAYMOBIL advent calendars available including Unicorn Fairyland, and Dragons Treasure Battle. Available to buy from PLAYMOBIL, Argos, Amazon, Toys R Us, John Lewis, Tesco and many more places! I believe that cocoa farmers should receive a fair pay for their work and products, and so I'm a big fan of Divine who pay fairly for their ingredients by fairtrade. As you open each door of this advent calendar, you not only get to enjoy a heavenly milk chocolate heart but you also get to enjoy the nativity story as it unfolds each day. Illustrated by Stephen Waterhouse, it's not only a delicious advent calendar, but one that tells the story of Christmas too! This is one of two calendars available from Divine this year. Available to buy from Divine, Amazon, Tesco, Ocado and independant stores. 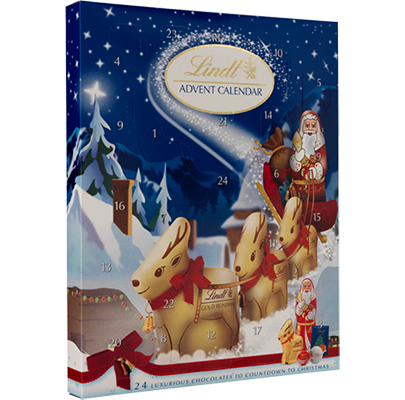 Filled with 24 iconic Lindt Christmas milk chocolate novelties, including mini reindeer hollows, Lindor milk chocolate mini truffles and mini santa hollows, this calendar is well worth the price. Lindt is one of the leading chocolatiers around, you pay for what you get, and what you get with Lindt is a truly amazing chocolate experience every single time! This calendar is just one of a few available to purchase from Lindt this year! Available to buy from Lindt, Sainsbury's, Amazon, Waitrose, Tesco and Ocado. 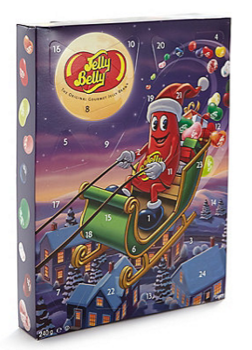 Most advent calendars you see are filled with chocolate, which Spud isn't the biggest of fans of, so we was super pleased to discover a jelly bean one, but not just any jelly bean one, a Jelly Belly advent calendar! Featuring Mr Jelly Belly in the festive mood, dressed as santa on the front, each triangle window opens the door to 24 pyramid bags weighing 10g each! With flavours such as Tutti Fruitti, Very Cherry, Bubblegum, Blueberry, Top Banana, Cotton Candy, Vanilla, Toasted Marshmallow and a special surprise flavour hidden behind door number 24, it's not only a tasty calendar, but an exciting one too! The jelly beans are made with real fruit purees where possible and the calendar is suitable for vegetarians! It's also gluten, dairy, fat and peanut free! Available to buy from Jelly Belly, John Lewis, Debenhams, Amazon and Ocado. What's more better than a chocolate advent calendar? A personalised chocolate advent calendar of course! Add a picture of your choice to make this personalised advent calendar for a special someone! Behind each of the 24 windows, you'll find a festively wrapped continental milk chocolate bauble, sweetening the lead up to Christmas day! This is just one of four personalised calendars from Fotoinsight! Available to buy from Fotoinsight. 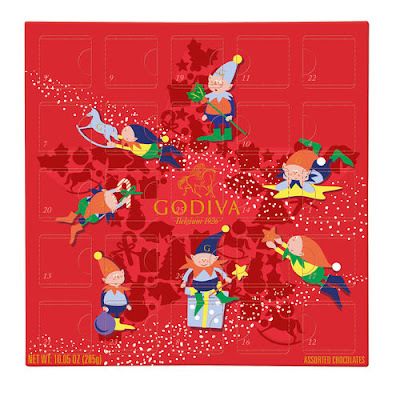 Counting down to Christmas with elves, (seven elves to be precise) is just one marvelous reason as to why you need this calendar in your life, but of course there's the fact that you get to enjoy delicious chocolate too! Chocolatiers from Belgium since 1926, Godiva is known worldwide for its luxury and delicious chocolates, just bill santa for the price! Available to buy from Godiva, John Lewis, Harrods and Selfridges. Unfortunately not all of us can eat what we'd like, with intolerances to food becoming more known, its great to see Holland and Barrett doing their fair share and creating a dairy free advent calendar for those who have dairy allergies and intolerances! 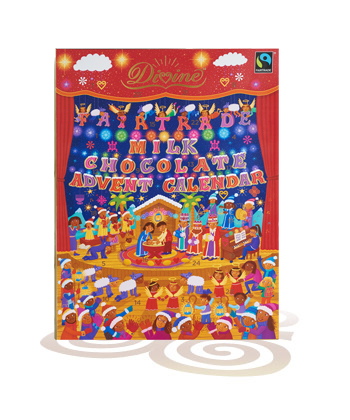 Suitable for vegans and coeliacs, this free from advent calendar is made with a blend of cocoa, sugar and rice powder, so no one has to miss out! This is one of two advent calendars from Holland & Barrett this year. Available to buy from Holland & Barrett, both online and in selected stores! 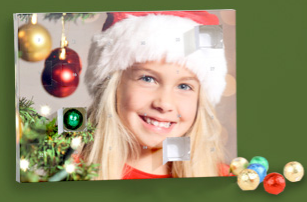 Sadly, Kinder® don't have an advent calendar, but don't fear because the amazing company who is Fotoinsight have come up with a brilliant product invention, a personalised Kinder® advent calendar! Simply upload a picture of your choice onto the calendar, and enjoy 24 delicious Kinder® treats - Kinder® chocolate, Kinder Country®, Kinder Bueno® and Kinder Choco Bons®! This is just one of four personalised calendars from Fotoinsight. 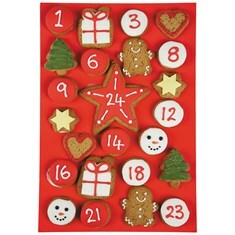 Another non chocolate advent calendar is the marvelous Gingerbread Advent Calendar from Dobbies! Spud loves Gingerbread and can't wait to taste the delicious treats! 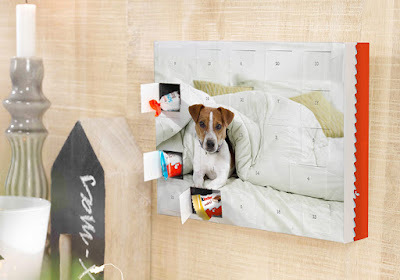 Unlike other advent calendars, there is no doors, making the calendar see through! Some of the items are numbered, meaning if you'd like, you can choose between a mini gingerbread man, a christmas tree, a present, a star or a snowman on the un-numbered days! This is one of two calendars available to buy from Dobbies this year. Available to buy from Dobbies Garden Centres. 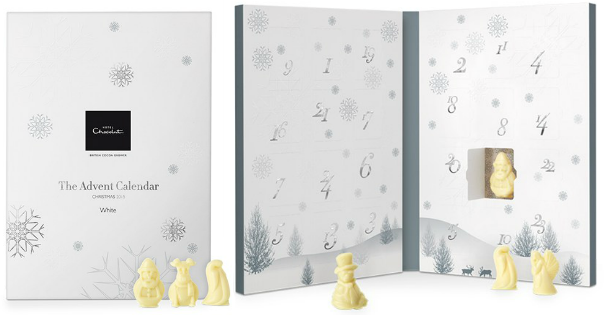 So many advent calendars are milk chocolate, so I was super pleased to see Hotel Chocolat do a variety of chocolate calendars, including truffles for two, milk, dark and white chocolate - my favourite! 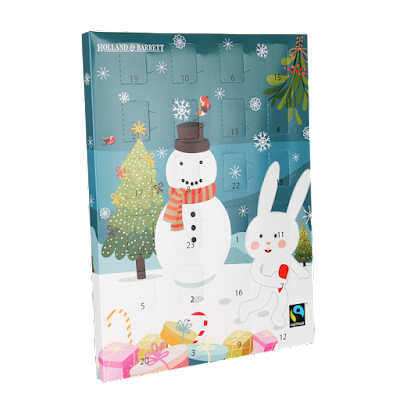 With a lovely festive design, the calendar opens up like a book, featuring 24 beautiful and delicious chocolate Christmas sculptures including reindeer, snowmen, enchanted Christmas tree's and penguins, just to name a few! This is just one of four calendars available from Hotel Chocolat. Available to buy from Hotel Chocolat online, and at selected stores. If you've not got a sweet tooth then this is the perfect calendar for you! This collectable advent calendar from the world's favourite candle company reveals a tealight candle every day, apart from door 24 where you'll receive an extra treat! 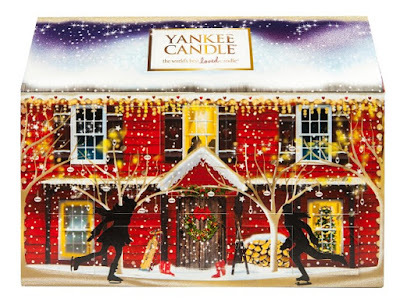 Fragences include Candy Cane Lane, Bundle Up, Snowflake Cookie, Icicles, Winter Glow, Christmas Eve, and Spiced Orange. Available to buy from Yankee Candle, House of Fraser and Amazon. 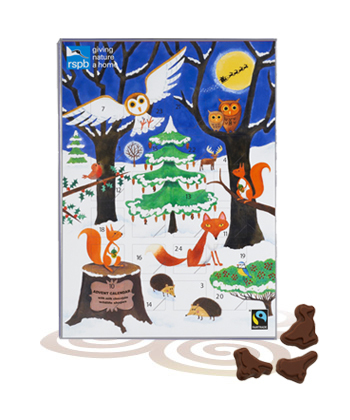 Another lovely Fairtrade calendar, again from Divine, only this time, by purchasing this milk chocolate RSPB advent calendar, created in partnership with Divine Chocolate, you will be helping UK nature! Open up the 24 doors to find chocolate wildlife shapes, well happily knowing you helped what we all need! Available to buy from Divine and independant stores. 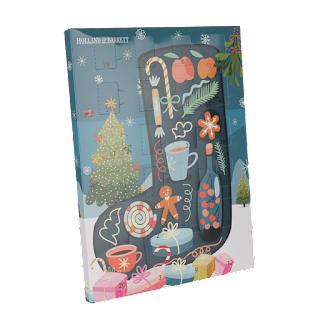 This festively presentation advent calendar features milky chocolate with no added sugar! It's dairy, gluten and nut free, and suitable for vegans and coeliacs! Made with sweetened cocoa, xylitol and soya, this delicious dairy free calendar is another brilliant product from Holland & Barrett! 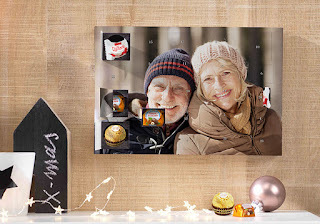 This is yet another wonderful product from Fotoinsight, Ferrero® don't do advent calendars, but don't worry about missing out because you could not only have a Ferrero® advent calendar, but you could have a personalised Ferrero® advent calendar! Simply upload your preferred image, and then enjoy 24 doors filled with Ferrero® classics like Ferrero Rocher®, Raffaello® and Ferrero Kusschen®!